When baby Jake was first born, I agonised over which play mat to get. I always saw photos of babies on this pretty play mats and I wanted to get the best one I could. There is soooo much choice out there that in the end I wanted something a little different. I absolutely LOVE Mamas & Papas stuff - it is always stylish, top of the line and attractive. There items have babies in mind and offer support in their development. So I headed over to the Mamas & Papas site and took a look. 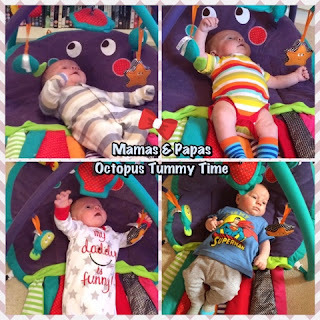 The 'Tummy Time Octopus Playmat' stood out immediately; it was attractive, colourful, cute and included the tummy time option which I wanted to make sure we had (as this is important for baby's development and to avoid flat head syndrome). The playmat has several interactive features which help babies to develop their touch, sight and sound skills. You can see that Jake really loves spending time with his octopus and it really excites him; his arms thrash as he tries to reach the interactive attachments and his legs kick vigorously against the 'noisy' tentacles. It has been a huge success, and I'm glad I took the time to look around before just ordering a common, cheap alternative. Mamas & Papas also do the 'Magic Stargaze Stripe Playmat' which Luke and I would really like to try with Jake, but it is a bit more expensive. Perhaps Santa will bring one, if we're lucky! Which playmat/ playgym does your little one have?